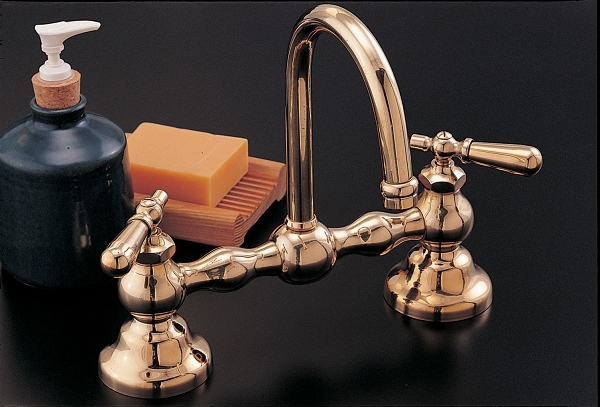 Columbia Faucet Set with Gooseneck Spout and Brass Lever Handles. 1/4 turn ceramic valves, which consist of 2 ceramic disks that rotate to open and close the valve, minimizing mechanical wear. Available in 8-inch (shown) or 12-inch widths. Maximum counter thickness 1-1/2 inch. Solid brass construction available in Chrome, Polished Nickel, Lacquered Brass (as shown in image), Matte Nickel or Oil Rubbed Bronze finish.